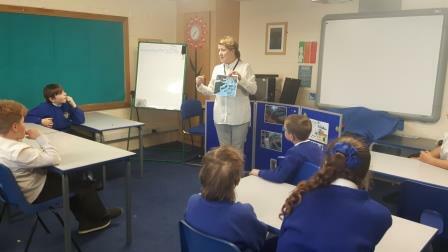 Calderdale Council’s’ Recycling Team Adviser, Chris Crossley, visited Whitehill Community Academy’s Junior Wardens on Wednesday 25 April to explain the importance of recycling and the negative effect it can have on our environment and wildlife if we fail to do so. In the session, organised by Heather Stout from the Ovenden Initiative, Chris showed the junior wardens the kind of things they can recycle. There was a good discussion about recycling other things from home and how a lot of containers can be reused around the house. A number of junior wardens talked about the things they reused at home and nearly all said their mums and dad used reusable shopping bags. She also explained that all councils now have targets to meet and that Calderdale no longer sends any rubbish to go to landfill. The session included a brief history lesson on how some of our ideas for how we recycle today came about years ago and what things were recycled when Heather and Chris were the same age as the Junior Wardens. Most of the Junior Wardens said that their households recycle, and those that don’t promised to ask their mums and dads to make more of an effort.